These bottle openers, made of cast iron, are shaped to mimic the look and feel of classic tools. These bottle openers, made of cast iron are shaped to mimic the look and feel of classic tools. Each piece is functional artwork that can sit anywhere in your house. Choose from wrench or hammer. Made in the Toyama region of Japan. Great experience with customer service. Can be used as a paperweight or a bottle opener. It doesn't look like a bottle opener so it's a nice statement piece to have out to be seen. Gift recipient was very pleased! I bought this as a gift for my bother, who loves tools and beer, so I figured it would be a good fit. He thought is was a great idea. I gave it to him along with some bottled beer. It is quite heavy and seems like it should hold up well. Son loves to camp and cook. He has complete set of cast iron pots and pans for these endeavors and was pleased to add another piece to the set. 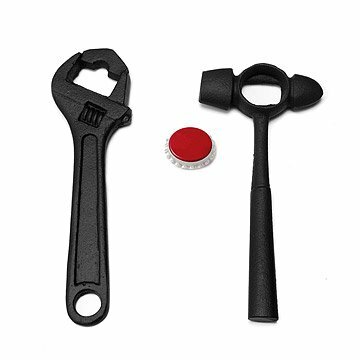 Great gift for anyone who needs a bottle opener! This opener is a talking piece for sure! My husband is a mechanic, and all the people who come over think its the coolest opener they have ever seen. Great bottle opener, not too heavy, well designed.